Every day, hundreds of cycle yards all around the country just like you are looking for parts to satisfy their customers. When you become a part of this growing network, you can tie your business into the flow of part requests from others in and around your area. Quickly sell bikes and parts with confidence. See messages like this on your desk or countertop. 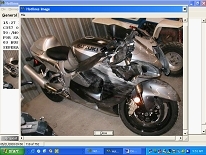 Send and receive pictures of your bikes and parts, and sell to hundreds of other yards all around the country. Let your customers know you can find the part they're looking for quickly ' even if you don't have it right now. Stop wasting your time surfing the web, spending hours looking for parts. Make it work for you, with Hotlines. Buy and sell your parts with confidence to hundreds of other premium motorcycle yards all across the country. Send your response to any part request with just a few simple keystrokes. Send Private Messages to anyone on the network. Match incoming requests against your own inventory automatically and have your Hotlines PC alert you when it finds a match so you can sell your parts quickly! Search your local area, your state or nationwide for specific parts for motorcycles, 3 wheelers or quads. Use Hotlines to buy new salvage for your yard. Get Internet requests that come to your desktop. Respond to them with just a few keystrokes and see your sales grow! All equipment is included with your monthly subscription. Strict Roll Call procedures are in place to ensure payment and fast resolution of any disputes.